Growing up in a house such as this you are taught about the sacrifices that those in the military and their families make. I am lucky that my mother and father served during the Cold War. While my father did spend time in Korea while I was a child, neither of my parents were in combat. The time away from my father was difficult for our family, and it took a strong woman, my mother, to raise two kids under ten while my father was overseas. My family is still highly involved in Veteran’s organizations and my father still, works with veterans. Both of my parents taught me that blue and gold star families deserve to be treated with honor and respect. It takes all sorts of people, from all different backgrounds to make the all-volunteer American Army as great as it is. The sacrifice of these families should never be forgotten. Politicians should always remember and honor our troops and their families. 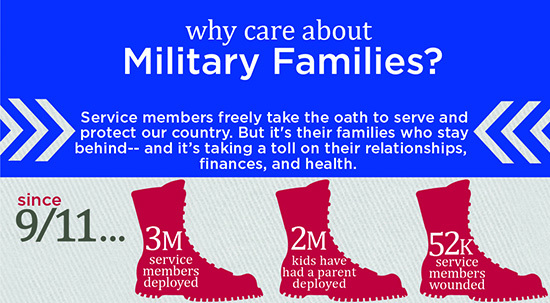 No service member can do it without the support of his or her family. I am grateful to not be a member of a gold star family, but I will always remember, even if I disagree with them politically, morally, or socially to honor the sacrifice they made.